This’ll be a quickie, as I am running around getting ready this morning. Which is kind of dumb, I’m running around every morning. Details, details. As I mentioned in yesterday’s post, I’m being a little lax about the Whole30 rules. Lunch was partially eaten standing over the counter as I dug into the massive ham bone. Then I cleaned myself up and finished at the table like a lady. 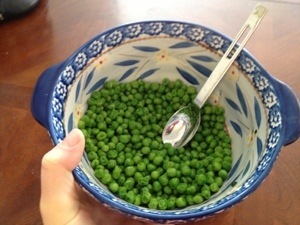 Eating a massive bowl of plain peas. Don’t worry, I saved a couple of spoonfuls for Squish. Dinner was a clean-out-the-fridge night. The last of the ham (yay! 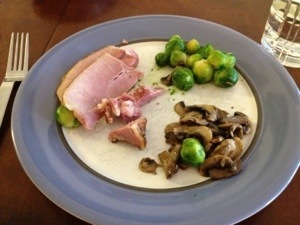 And Sad Panda, that was really good ham), brussel sprouts, and sautéed mushrooms. This morning I got in a quickie 2.4 mile run and did a set of squats in the weight room. I added 10 lbs to my squat, which is great, but I was really nervous about the fact that I don’t have a rack. But I guess I haven’t hit my one rep max yet on my clean and press, because I’m still able to get the bar over my head and shoulders. 55# squats FTW! Hulk and I tag-teamed breakfast this morning. 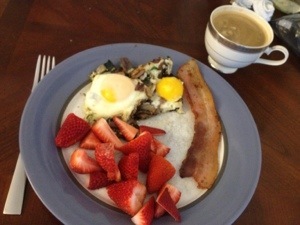 He made bacon and egg scrambles while I cut up strawberries and made the coffee. It is soooo nice having Hulk up with me in the morning. Mostly because I can make the bed. Throwing a totally random lunch together from the leftover depths if the fridge. 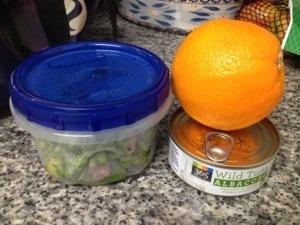 Leftover brussel sprouts from last night mixed with the bacon peas from Easter, can o’ tuna, orange. Normally I don’t eat so much fruit. There’s nothing wrong with fruit, i jst try to eat less sugary, more nutrient-dense things when i can. But we have a pile of it that no one has been going through so I’m taking a few for the team. My sugar demon is still lying in wait so my cravings haven’t kicked in yet. Once the cravings start I’ll pull off the fruit until I have it under control. Have a happy hump-de-hump day! Forgot to say…..I am so leery of squatting without a rack too! That may be on the “must buy” list soon! Just for safety and comfort. Hubby will have to give me a bit more space in the garage though. (Or I could just clean in there, make my own room lol). I use the gym in our apartment building. They have a Smith machine, but I hate using it, it feels too weird. I suppose I’ll have to convert over when my weight gets too high to clean over. I’m just terrified of tweaking my shoulder/back trying to get the bar up. Get rid of those dates! That would be the first thing I go for!